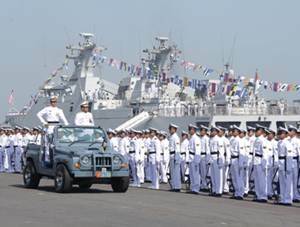 Tentara Nasional Indonesia Angkatan Laut - TNI AL its the Indonesian Navy. TNI AL is one branch of the armed forces and is part of the Indonesian National Army (Tentara Nasional Indonesia/TNI) in charge of the defense operations of the Republic of Indonesia in the sea. Headquartered in Jakarta, TNI AL now has 2 Fleet Commands, namely Fleet Command West Region (Koarmabar) and Fleet Command East Region (Koarmatim). Koarmabar is located in Tanjung Priok Jakarta, while Koarmatim situated at Surabaya East Java. TNI AL also operates 1 Military Sea Traffic Command (Kolonlamil) in Tanjung Priok Jakarta. As of 2011, TNI AL supported by approximately 74,000 active personnels. TNI AL also supported by more than 138 naval warships (KRI), including 40 units of KRI Striking Force, 50 units of KRI Patrolling Force, 48 units of KRI Supporting Force. Since 31 December 2014, Chief of Naval Staff (KASAL) chaired by Admiral Ade Supandi who replaced Admiral Marsetio who have retired. Indonesian citizens (WNI), Male and Female, faithful and devoted to God Almighty, true to NKRI based on Pancasila and the Constitution of the Republic of Indonesia Year 1945, not Civil Servants (PNS). Age as low as 17 years and 9 months and a maximum of 22 years on 17 March 2017. Minimum education of Junior high school (SMP) or equivalent. Minimum height 163 cm with a weight balanced. Well-behaved and not lose the right to be a soldier under the court ruling which has permanent legal power accompanied by Police Notes (SKCK) of the local police. Physically and mentally healthy, not tattooed and pierced and scars, not color blind and bespectacled. Not married and willing not to get married during during the First Education Program (Dikma) and for 2 years after completion Dikma. Willing to undergo First Association Office (IDP) for a minimum of five (5) years and a maximum of 10 (ten) years from the time of start inducted into the Triton Two / Private Second Class. Belawang : Mako Lantamal I - Jl Serma Hanafiah No 1 Belawan. Sabang : Mako Lanal Sabang Jl. Yos Sudarso, Sabang NAD. Padang : Mako Lantamal II Padang - Jl Bukit Peti-Peti Teluk Bayur Padang. Tanjung Pinang : Mako Lantamal IV - Jl Yos Sudarso Batu Hitam, Tanjung Pinang. Makassar : Mako Lantamal VI - Jl Yos Sudarso 308 Makassar. Kupang : Mako Lantamal VII - Jl Yos Sudarso, Kupang. Manado : Mako Lantamal VIII - Jl Walanda Maramis Kairagi Manado. Ambon : Mako Lantamal IX - Halong Teluk Ambon. Jayapura : Mako Lantamal X - Jl Amfhibi No 1, Hamadi, Jayapura. Merauke : Mako Lantamal XI - Jl Nowari, Merauke. Palembang : Mako Lanal Palembang - Jl Yos Sudarso No 1 Boom Baru, Palembang. Balikpapan : Mako Lanal Balikpapan - Jl Yos Sudarso 14, Balikpapan. Pontianak : Mako Lanal Pontianak - Jl Kom. Yos Sudarso No. 1 Pontianak. Sorong : Mako Lantamal XIV Sorong - Jl Bubara No 1 Kota Sorong. Kendari : Mako Lanal Kendari Jl RE Martadinata No 1 Kesilampe Kendari. Tarakan : Mako Lanal Tarakan - Jl Yos Sudarso Tarakan Kalimantan Utara. Mataram : Mako Lanal Mataram - Jl Malomba 2 Antenan Mataram. Banjarmasin : Mako Lanal Banjarmasin - Jl Ahmad Yani KM 3.5 Banjarmasin. Ternate : Mako Lanal Ternate - Jl Batu Angus Akehuda, Maluku Utara. Jakarta : Kantor Perwakilan Lapetal - Jl Gunung Sahari No 2, Jakarta Utara. Cirebon : Mako Lanal Cirebon - Jl Kesunean No 33 Cirebon. Lampung : Mako Lanal Lampung - Jl Yos Sudarso KM 10 Panjang Lampung. Prokimal Lampung : Kantor Prokimal Lampung - Jl Yos Sudarso No 1 Madukoro Kotabumi Lampung Utara. Bandung ; Mako Lanal Bandung - Jl Arya Jipang No 8 Bandung. Yogyakarta : Mako Lanal Yogyakarta - Jl Melati Wetan No 62, Yogyakarta. Cilacap : Mako Lanal Cilacap - Jl Niaga No 2 Cilacap. Tegal : Mako Lanal Tegal, Jl Proklamasi No 1 Tegal. Semarang : Mako Lanal Semarang - Jl R. Martadinata No 12, Semarang. Malang : Kantor Lapetal Malang - Jl Yos Sudarso No 16, Malang. Banyuwangi : Mako Lanal Banyuwangi - Jl Raya Situbondo No 54, Ketapang, Banyuwangi. Surabaya : Mako Lantamal V - Jl M Natsir No 56 Surabaya. Denpasar : Mako Lanal Denpasar - Jl Raya Sesetan No 331 Denpasar Bali. JobsCDC.com now available on android device. Download now on Google Play here. Please be aware of recruitment fraud. The entire stage of this selection process is free of charge. TNI Angkatan Laut - Recruitment Calon Tamtama PK TNI AL November 2016 will never ask for fees or upfront payments for any purposes during the recruitment process such as transportation and accommodation.